This post is intended for those of the ages 21+. Rose gummy recipe. This post contains affiliate links, please see our Site Policies for further information. The other day Brit+Co aired an article about Sugarfina Rose Gummy Bears and their 400+ person waitlist. Sugarfina has come out and said it’s already into the 3000s. That’s right, they are making gummy bears with Rosé wine! With Rosé’s major popularity right now it’s kind of no surprise that they have a waitlist. While Sugarfina is the bomb when it comes to candy, I’m the impatient type and when I want something, I want it now. With my Firecracker Jello Shots hitting the blog earlier this week, I happened to have some extra gelatin hanging around that needed to be used. Lucky for you, I just so happen to always have Rose hanging around. With that, I took off to the kitchen to do a little experimentation cooking. With some trial and error, I was able to come up with my own Rose Gummy Bear recipe (or gummy roses because I didn’t have a bear mold) so you don’t have to wait! Bonus: These Rose Gummies still contain their alcohol! Oh wow, these Rosé gummy candies are so delicious! They are light, sweet, and crisp just like our favorite Rosés. Not to mention this was an insanely simple candy recipe to make. Achem, stop judging my messy stove top. I know, I know, I’ll clean it. For this recipe, all you need to do is dissolve Rosé, lemon juice, sugar, and flavorless gelatin together overheat. 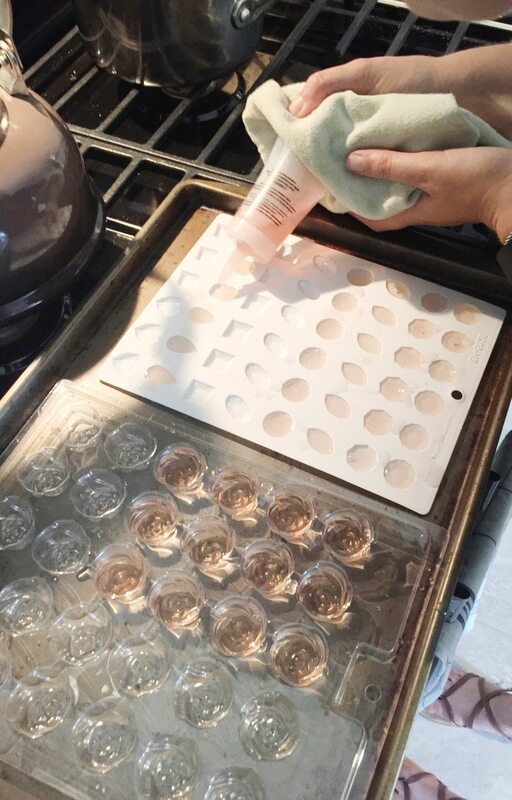 Add the mixture into a plastic rose mold and let refrigerate for two hours. How easy is that? Like I said, I didn’t have gummy bear molds on hand but I did have these chocolate flower molds and gem molds. The gem molds ended up being too shallow resulting in paper thin gummies. I wasn’t exactly a fan of those. However by filling the rose molds up only a third of the way, I got the perfect gummy size. Plus roses for Rosés! I can already see these being an amazing Bachelorette/Bachelor-themed recipe. 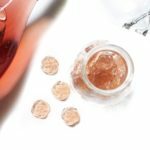 A delicious recipe for Rosé wine gummy candy that is super quick and easy to whip up. They last up to 3 weeks in the refrigerator. This does contain alcohol. Intended for ages 21+. In a saucepan over low to medium heat add your lemon juice and Rosé. Add in your sugar and whisk it until dissolved. One packet at a time whisk in your gelatin powder. Keep whisking over medium to low heat until it's fully dissolved. Once fully combined fill your molds with this mixture. Let sit in the refrigerator for two hours. Once firm remove from molds and enjoy. Last up to 3 weeks in the refrigerator in a sealed container. You can use any wine if you are not a Rose fan! These gummies keep best in the refrigerator and are good up to three weeks. By using low heat and a little patience to let everything combine, allows you to keep these gummies boozy. Which is the whole point, right? I hope you enjoy this wine gummy recipe and if you make them, send me a photo on Twitter or tag me on Instagram. Let me know down below, what is your favorite Rosé?